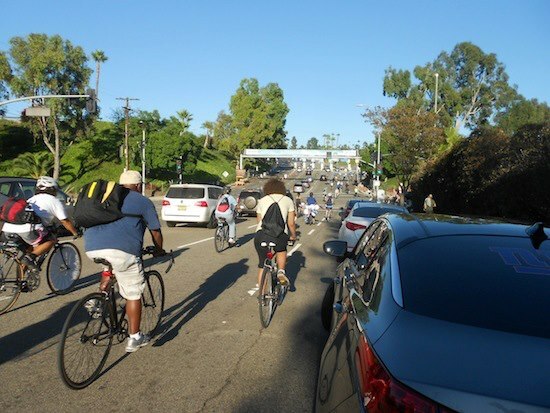 On Saturday, May 11, C.I.C.L.E., the Eastside Bike Club, Metro and the Dodgers will kick off Bike Week Los Angeles with a bicycle ride between two historic landmarks, Union Station and Dodger Stadium at Chavez Ravine, to watch the Dodgers battle the Miami Marlins. Deck yourself (and your bike) out in Dodgers gear and meet up with fellow riders at the front of Union Station – that’s the Alameda side – at 2 p.m. The ride will leave promptly at 2:30 p.m. Those with tickets to the game will enjoy early access, a free, exclusive stadium tour, pre-game activities and more. Use the code METRO when purchasing tickets to the game and get an exclusive discount. The ride is 3.5 miles each way, and keep in mind there’s a bit of a climb up to Dodger Stadium. Continue reading after the jump to see the full press release from C.I.C.L.E. and tips on what to bring for the game day bike ride. On Saturday, May 11th, 2013, C.I.C.L.E., the Eastside Bike Club, Metro and the Dodgers will kick off Bike Week Los Angeles with a bicycle ride between two historic landmarks, Union Station and Dodger Stadium at Chavez Ravine to watch the Dodgers battle the Miami Marlins. Wear your Dodger Blue and decorate your bikes as we roll to the stadium alongside your favorite beats and tunes, like “Take Me Out to the Ball Game” and other favorites! There will be prizes for the riders displaying the best Dodgers pride. Participants who buy tickets to the game will enjoy early access, preferred and secure bicycle parking (bring a lock), an exclusive stadium tour, a sneak peek at batting practice, and access to the Pup Rally during Bark at the Park Night. Participants will also enjoy discounted tickets in a reserved section. Zip past game day traffic and straight to the infield! You won’t want to miss this exciting evening of bikes and baseball! This ride is 3.5 mile each way. There will be a climb to Dodger’s Stadium. Be prepared to pump your legs up the hill! The route will be family-friendly, leisurely paced and will return to Union Station after the game. This ride will be fully supported by C.I.C.L.E. and The Eastside Bike Club’s trained Ride Leaders and volunteers. This event is in partnership with Metro. Metro has contracted with C.I.C.L.E. to sponsor 20 bicycle rides in communities throughout L.A. County over the next two years. Where: Meet at Union Station (Alameda entrance courtyard). Time: Meet at 2:00 pm. Ride leaves promptly at 2:30 pm. Game Tickets: Your ticket and participation in the ride will give you access to a FREE, exclusive stadium tour and pre-game activities. Riders without a ticket will not be able to attend the stadium tour, batting practice, or game. You can buy your ticket with a special Metro discount here. http://www.metro.net/service/discounts/sports/dodgers/ Use offer code: METRO. You may buy any discounted seat that is available, but we encourage riders to buy tickets in the Preferred Reserve Section 48RS. These seats are available starting at $12.75. Let’s sit together to show our Dodgers & Bike pride when the Dodgers recognize us during the pre-game entertainment. What to bring: Your bicycle, in good running order, plenty of night lights, water and a lock. All participants should be able to ride a bike safely with the ability to brake, change gears, and balance while stopping and starting. All participants under 18 MUST wear a helmet and be escorted by a parent or guardian. Children under age 8 should be on a tag-a-long, bike trailer, tandem, or other safe child-carrying device to participate in the ride. About Metro: Metro plays an important role in bicycle planning across LA County, facilitating first mile/last mile connections to transit and supporting bicycle transportation through various policies and programs. From 1993 to 2011, Metro funded 158 bike projects totaling $155.5 million. About The Eastside Bike Club: A community bike club founded by Carlos Morales, in June 2008, one of the first bike clubs in Northeast LA responsible for creating a chain reaction in the Los Angeles cycling culture with a core foundation of providing, SAFE, HEALTHY and FUN BIKE RIDES for participants no matter of age or ability.